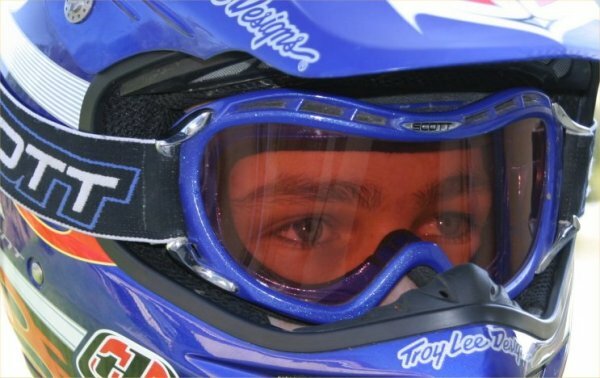 Like most MX riders I know, I spent years riding in Scott’s classic 80 series MX goggles, wearing them in every imaginable condition (well at least every condition you could imagine occuring in beautiful Southern California), and never having any complaints. Although I have worn many kinds of goggles in the past few years, I still hold a place in my heart (and my gear bag) for a pair of Scott 80-series. About six months ago, I received several pairs of Scott Goggles’ newer model, the HiVoltage II, for testing. The HiVoltage II features a streamlined, “high-tech” appearance that is quite a departure from the traditional styling of the 80-series goggle. Scott developed the HiVoltage II with input from its many sponsored pros, and the shape of the frame and vents above the lens are designed to provide excellent ventilation both for cooling purposes and to prevent fogging. The foam was specially developed to “achieve total sweat eradication”, and the goggles come with Scott’s AMP Rose lens fitted, although other lens options are available. After wearing the HiVoltage II goggles for 6 months, I have found that they excel in every area, achieving what should be the ultimate goal of any piece of protective gear – while riding, you don’t think about them at all. The foam is comfortable and does an excellent job of wicking away sweat, and the goggles are well ventilated, but the vents don’t let dust get into your eyes. Best of all, they fit over my glasses (I wear small frames, but Scott does offer a similarly designed goggle for wearers of larger glasses – the Voltage X OTG). Style is obviously a matter of taste, but I think the HiVoltage is one of the sweetest looking goggles out there. The styling is modern and aggressive without being too over the top. The quality of the finish is excellent, and the goggles look nearly new after months of use and abuse. I also liked the AMP Rose lens that came with the goggles, as it seemed to work well in every lighting condition except twilight and/or very overcast days. For these situations, I used Scott’s yellow lens, which seemed to increase the clarity of the view in low light. I also tried the AMP Blue lens, which I found somewhat similar to the AMP Rose, but not as good. Overall, the AMP Rose is the best choice for everday riding, at least in sunny SoCal.